Your item will be shipped within 2 days. We will accept returns only after you receive the item. Buyers are to pay the postage. We have 471 positive feedbacks on Ebay. We look for new and used items. It will tell you in our discription of the item if it is NEW or USED. This is a GRAND RAPIDS INDUSTRIAL PRODUCTS. 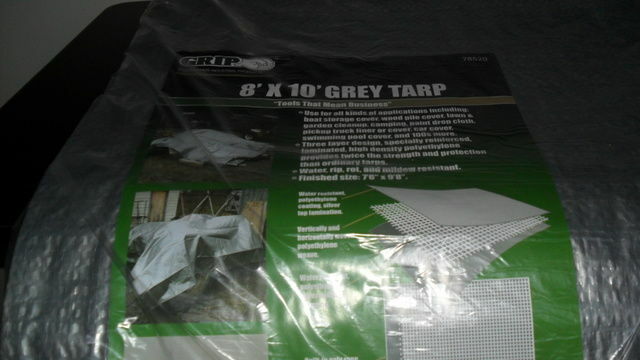 Can be used for boat covers, wood piles, lawn & garden cleanup, camping, paint drop cloth, pickup truck liner, etc. It is water, rip, and mildew resistant. It has water resistant polyethylene coating, silver top lamination. It has vertically & horizontally woven polyethylene weave. It has water resistant polyethylene silver bottom. Built-in poly rope hem prevents rips & tears. It has reinforced corners with rust proof grommets. We accept returnsB within 2 weeks. uyers are to pay for the postage.